Use of cloud computing by enterprise companies is growing rapidly. 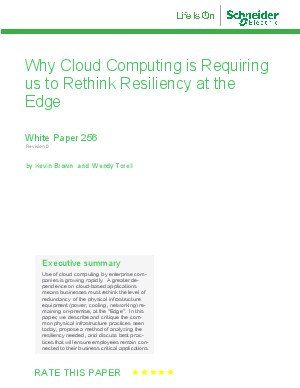 A greater dependence on cloud-based applications means businesses must rethink the level of redundancy of the physical infrastructure equipment (power, cooling, networking) remaining on-premise, at the “Edge”. In this paper, we describe and critique the common physical infrastructure practices seen today, propose a method of analyzing the resiliency needed, and discuss best practices that will ensure employees remain connected to their business critical applications.